Well, we are at it again! Grace, St. Alban’s, St. Thomas' and St. Patrick’s will work together to put on Vacation Bible School this summer. See the dates and mark your calendars now. V.B.S is. for Kindergarten – Fifth Grade – Older children are invited to help. The dates and time for V.B.S. are July 12-16, 2015 from 6:00 p.m. till 7:30 p.m. Registration will start at 5:30 p.m. on Sunday, July 12. Our theme this year is S’more Campfire Stories. 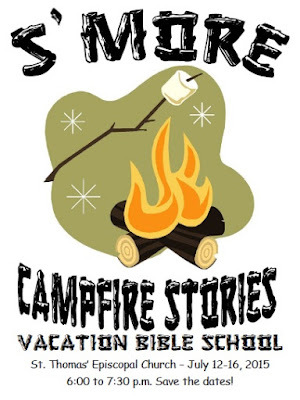 It is a camping/summer camp theme with familiar camp songs, snacks/food, games, Bible Stories and crafts. We will take advantage of St. Thomas’ beautiful bayou location, hiking trail (walking path) and their new outdoor pavilion and fireplace. Dinner is served each night and a special closing is planned for the last evening. Registration forms are available at church or here.